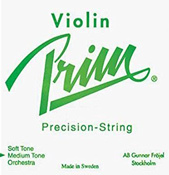 Prim Strings are the popular choice for folk style music for their quick response, low cost, high durability and ease of tuning double-stops. Solid Steel core, wound with Chrome steel. Orchestra gauges are thicker, so they produce more volume, but are less bright.